The CX7 records rich high-definition footage straight to a flash memory card (Sony's Memory Stick PRO Duo), so it feels light and compact in your palm, and the 2.7-in. 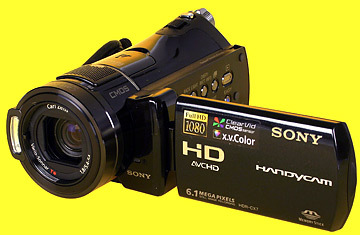 LCD screen features touch controls for set up and playback. Should you get the shakes while shooting, the CX7 has the ability to stabilize the image (using optics, which is more effective than a digital correction) and smooth out the action. A built-in HDMI port lets you connect the camera to an HDTV and watch your home movies in all their high-def glory.